When cargo is too long for the standard Removable Gooseneck (RGN), we sometimes employ the stretch RGN. Like the standard RGN, the back portion of the stretch RGN is removable, creating a convenient ramp. The stretch RGN has a versatile extension feature that allows it to meet an increased number of length requirements for cargo. WHAT IS A STRETCH RGN TRAILER USED FOR? In many cases, a standard RGN gets the job done when the convenient removable drop feature needs to be utilized. 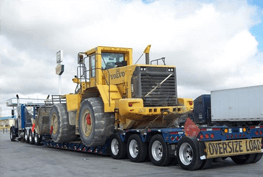 When the cargo in question is especially long, however, the stretch RGN has to be employed to fit the specifications of the tractor or equipment in focus. Not sure if your tractor or equipment fits into these categories? 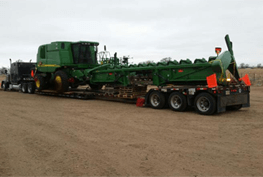 Contact Tractor Transport with the dimensions of your cargo and we'll get you fixed up with one of our many versatile and reliable pieces of hauling equipment. 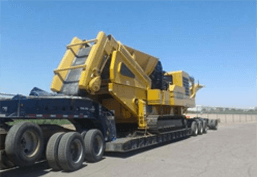 The Stretch RGN or Removable Gooseneck Trailer is designed to carry and haul freights that are too long to be carried by a standard type of RGN. Depending on the weight of the freight, axles may range from 3 axles or higher. This means that the heavier the load is the more axles are to be used. 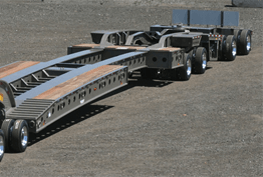 The stretch removable gooseneck trailer, or stretch RGN, is specially designed to carry and haul loads that are too long for the standard type of RGN. We have the best RGN truckload rates. Depending on the weight of the load, this trailer can be adapted with 3 or more axles. The heavier loads would use additional axles. The detachable gooseneck front allows the trailer to be dropped on the ground, just as with the standard RGN, creating a convenient ramp for loading heavy freight. Booking a shipment with us is easy- Our knowledgeable staff of transport specialists are ready to meet your shipping needs, and answer any questions you may have. Call Now: (877) 373-0109 Our business hours are Monday through Sunday 8:00 AM to 8:00 PM EST. Fill out the quote form to the right, and we will email you an up to date rate. For the fastest most accurate no hassle estimate - contact us by phone.